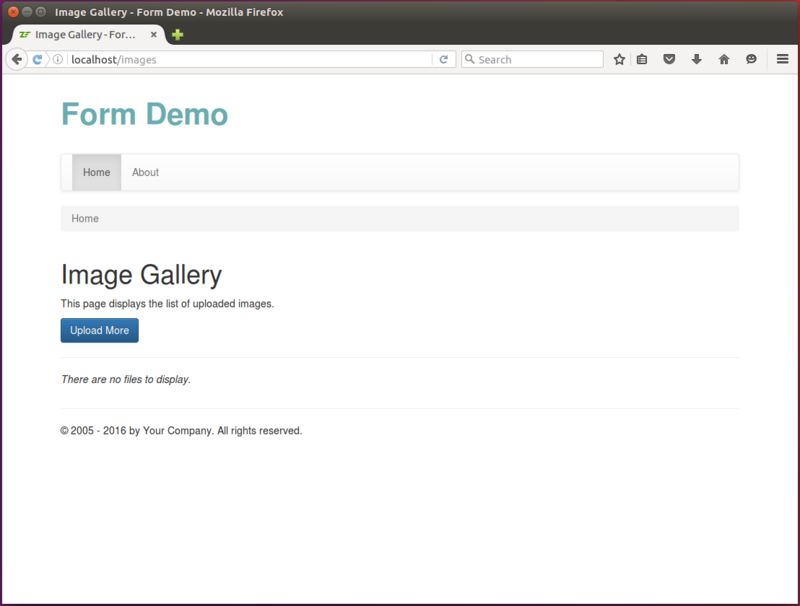 To demonstrate the usage of file uploads in Zend Framework 3, we will create an Image Gallery that will consist of two web pages: the image upload page allowing to upload an image (figure 10.2); and the gallery page containing the list of uploaded images (figure 10.3). 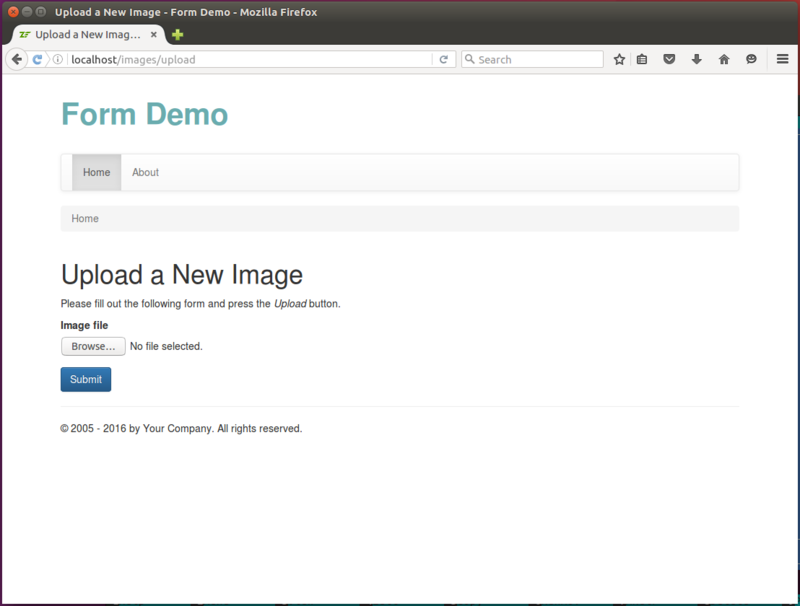 You can see the working Image Gallery example in the Form Demo sample application bundled with this book. a view template .phtml file per each controller's action method. and the submit button field allowing to send the form data to server. // This form is used for uploading an image file. // Set POST method for this form. // Set binary content encoding. // This method adds elements to form. // Add the submit button. We have already discussed the form model creation and the code above should not cause any problems in its understanding. We just want to attract the attention of the reader that in line 19, we set the "multipart/form-data" value for the "enctype" attribute of the form to make the form use binary encoding for its data. Actually, explicitly setting the "enctype" attribute in form's constructor is optional, because Zend\Form\Element\File element performs that automatically when you call form's prepare() method. move the uploaded file to its residence directory using the RenameUpload filter. // Add validation rules for the "file" field. UploadFile validator (line 32) checks whether the uploaded file was really uploaded using the HTTP POST method. MimeType validator (line 34) checks whether the uploaded file is a JPEG or PNG image. It does that by extracting MIME information from file data. 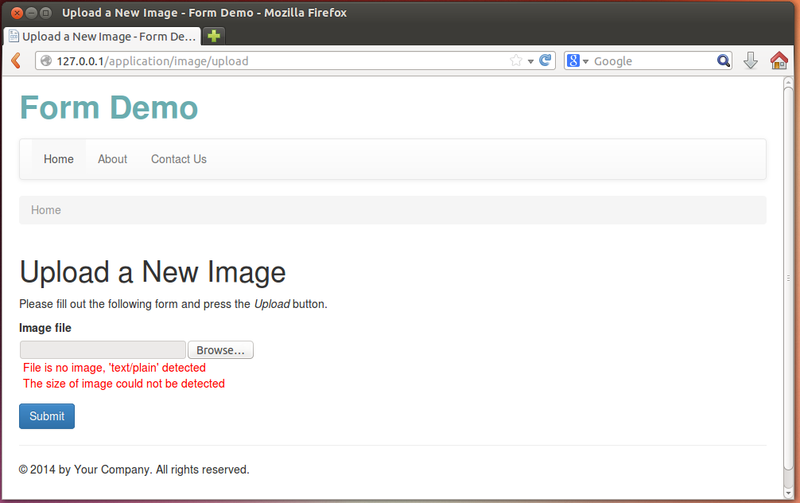 IsImage validator (line 39) checks whether the uploaded file is an image file (PNG, JPG, etc.). It does that by extracting MIME information from file data. ImageSize	validator (line 41) allows to check that image dimensions lie in an allowed range. In the code above, we check that the image is between 128 pixels and 4096 pixels in width, and that the image height lies between 128 pixels and 4096 pixels. In line 52, we add the RenameUpload filter and configure it to save the uploaded file to the APP_DIR/data/upload directory. The filter will use the same file name for the destination file as the name of the original file (useUploadName option). If the file with such name already exists, the filter will overwrite it (overwrite option). For the MimeType and IsImage validator to work, you have to enable PHP fileinfo extension. This extension is already enabled in Linux Ubuntu, but not in Windows. After that, do not forget to restart Apache HTTP Server. Because we strive to write code conforming to Domain Driven Design pattern, we will create a service model class encapsulating the functionality for image management. We will call this class ImageManager and put it to Application\Service namespace. We will also register this service in the service manager component of the web application. Table 10.3. Public methods of the ImageManager class. getSaveToDir() Returns path to the directory where we save the image files. getSavedFiles() Returns the array of saved file names. getImagePathByName($fileName) Returns the path to the saved image file. getImageFileInfo($filePath) Retrieves the file information (size, MIME type) by image path. getImageFileContent($filePath) Returns the image file content. On error, returns boolean false. resizeImage($filePath, $desiredWidth) Resizes the image, keeping its aspect ratio. In fact, we could put the code we plan to add into the service into the controller actions, but that would make the controller fat and poorly testable. By introducing the service class, we improve the separation of concerns and code reusability. // The image manager service. // The directory where we save image files. // Returns path to the directory where we save the image files. As you can see from the code above, we define the ImageManager class in line 5. It has the private $saveToDir property 44 which contains the path to the directory containing our uploaded files (line 8) (we store uploaded files in APP_DIR/data/upload directory). The getSaveToDir() public method (line 11) allows to retrieve the path to the upload directory. 44) Although the ImageManager class is a service and focused on providing services, it can have properties intended for its internal use. // Returns the array of uploaded file names. // The directory where we plan to save uploaded files. throw new \Exception('Could not create directory for uploads: ' . // Scan the directory and create the list of uploaded files. continue; // Skip current dir and parent dir. // Return the list of uploaded files. In the getSavedFiles() method above, we first check if the upload directory exists (line 16), and if not, we try to create it (line 17). Then, we get the list of files in the directory (lines 24-32) and return it to the caller. and the getImageFileContent() will read file data and return them as a string. // Returns the path to the saved image file. // Take some precautions to make file name secure. $fileName = str_replace("/", "", $fileName);  // Remove slashes. $fileName = str_replace("\\", "", $fileName); // Remove back-slashes. // Return concatenated directory name and file name. // Returns the image file content. On error, returns boolean false. // Retrieves the file information (size, MIME type) by image path. // Get file size in bytes. // Get MIME type of the file. // Resizes the image, keeping its aspect ratio. // Get original image dimensions. // Return the path to resulting image. The resizeImage() method above takes two arguments: $filePath (the path to the image file), and $desiredWidth (the width of the thumbnail image). Inside the method, we first calculate an appropriate thumbnail image height (lines 11-16) preserving its aspect ratio. Then, we resize the original image as needed and save it to a temporary file (lines 19-32). Table 10.4. Action methods of the ImageController class. __construct() Will allow to inject ImageManager dependency into the controller. uploadAction() Shows the image upload page allowing to upload a single image. indexAction() Displays the image gallery page with the list of uploaded images. fileAction() Provides an ability to download a full-size image or a small thumbnail for an image. // This controller is designed for managing image file uploads. // Image Gallery page which contains the list of uploaded images. // open the image file in a web browser or generate a thumbnail. In the code above, we defined the ImageController class living in the Application\Controller namespace and added the constructor method and three action method stubs into the class: indexAction(), uploadAction() and fileAction(). Next, we will populate those action methods with the code. First, we will complete the uploadAction() method of our controller. This action method will handle the Upload a New Image web page containing the upload form. The form will provide an ability to upload an image file to the gallery. // Move uploaded file to its destination directory. // Redirect the user to "Image Gallery" page. In the uploadAction() method above, we do the following. In line 9, we create an instance of the ImageForm form model with the help of the new operator. In line 25, we call the form model's isValid() method. This method runs the input filter attached to the form model. Since we have only one file input in the input filter, this will only run our three file validators: UploadFile, IsImage and ImageSize. If the data is valid, we call the getData() method (line 28). For our file field, this will run the RenameUpload filter, which moves our uploaded file to its persistent directory. After that, in line 31, we redirect the user to the "index" action of the controller (we will populate that action method a little bit later. Please fill out the following form and press the <i>Upload</i> button. In the code of the view template, we first set "class" attribute (line 3). This is to apply nice-looking Twitter Bootstrap styles to the form's Submit button. Then, we render the form with the common view helpers that we discussed in Collecting User Input with Forms. For rendering the "file" field, we use the generic FormElement view helper. Typically, you use the FormElement generic view helper for rendering the file field. The FormElement internally calls the FormFile view helper, which performs the actual rendering. The second action method we will complete is the indexAction(). This action will handle the Image Gallery page containing the list of uploaded files and their small thumbnails. For each image, there will be a button "Show In Natural Size" for opening the image in another tab of the web browser. // Get the list of already saved files. In the code above, we use the getSavedFiles() method of the ImageManager class for retrieving the list of uploaded images and pass them to the view for rendering. Please note how "slim" and clear this controller action is! We achieved this by moving the image management functionality to the ImageManager service model. This page displays the list of uploaded images. <a href="<?= $this->url('images', ['action'=>'upload']); ?>"
In the code above, we create the HTML markup for the Upload More button. Under the button, we use check whether the $files array is empty. If the array is empty, we output the "There are no files to display" message; otherwise we walk through the files and output the thumbnails of each uploaded images. For rendering a thumbnail, we use the <img> tag. We set its src attribute with the URL pointing to the "file" action of our ImageController controller. We pass two parameters to the action via the query part of the URL: the image name and thumbnail flag. For styling the thumbnails, we use the Twitter Bootstrap provided ".img-thumbnail" CSS class. For additional information about these Twitter Bootstrap styles, please refer to the Bootstrap official documentation. Below each thumbnail, we put the "Show in Natural Size" link, which points to the "file" action of our ImageController controller. When site visitor clicks the link, he will be shown with the image in natural size, and the image will be opened in another browser's tab (note the target="_blank" attribute of the link). the "thumbnail" parameter is a flag telling whether we want to dump the full image or its small copy. // Get the file name from GET variable. // Check whether the user needs a thumbnail or a full-size image. // Get path to image file. // Get image file info (size and MIME type). // Set 500 Server Error status code. // Remove temporary thumbnail image file. // Return Response to avoid default view rendering. In the code above, we first get the "name" and "thumbnail" parameters from $_GET super-global array (lines 9, 12). If the parameters are missing, their default values are used instead. In line 15, we use the getImagePathByName() method provided by the ImageManager service to get the absolute path to the image by its name. If a thumbnail is requested, we resize the image with the resizeImage() method of the ImageManager (line 20). That method returns path to a temporary file containing the thumbnail image. Then, we get the information about the image file (its MIME type and file size) with the getImageFileInfo() method of the ImageManager (line 24). Finally, we create a Response object, fill its headers with image information, set its content with data of the image file (lines 32-45), and return the Response object from the controller action (line 53). Note that returning the Response object disables the default rendering of the view template for this action method. By this reason, we do not create the file.phtml view template file. Because our ImageController uses the ImageManager service, we need to somehow pass it the instance of the ImageManager (to inject the dependency into the controller's constructor). We do this with the help of factory. After that, you will be able to get access to our image gallery by the URL like "http://localhost/images", "http://localhost/images/upload" or "http://localhost/images/file". Above, the chown and chmod commands set the Apache user to be the owner of the directory and allow the web server to write to the directory, respectively. If you now enter the URL http://localhost/images into your web browser's navigation bar, you will see the image gallery page like shown in figure 10.4. Clicking the Upload More button will open the Upload a New Image page where you can peek an image file for upload. If you pick an unacceptable file (not an image, or too big image), you will see validation errors (see the figure 10.5 below). If the upload is completed successfully, you will be redirected back to the Image Gallery page and see the uploaded image in the list of thumbnails. 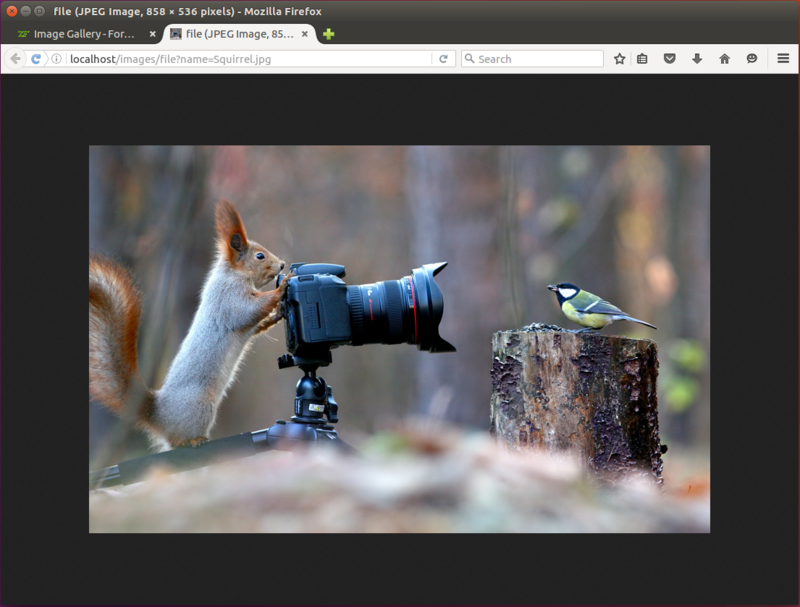 Clicking the View Full Size button will open the image in a new browser tab (see the figure 10.6 below for example). 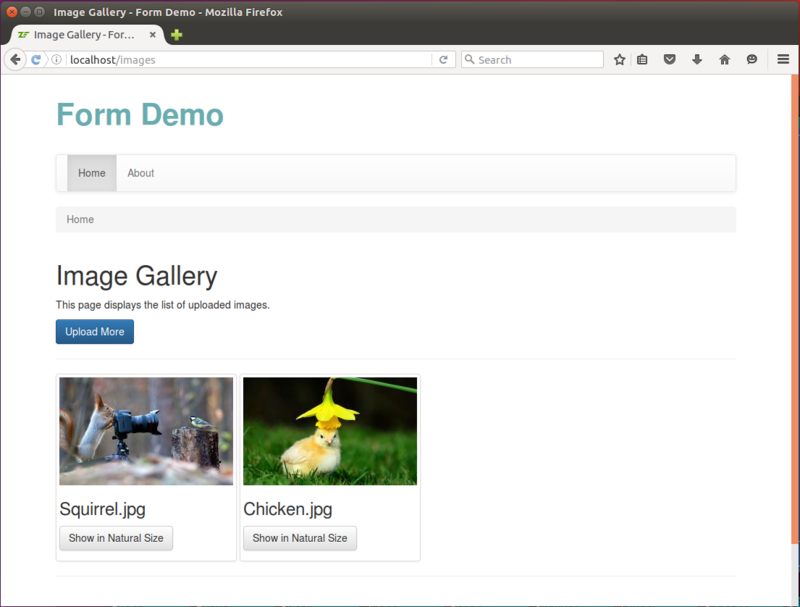 You may find the Image Gallery complete example in the Form Demo sample web application bundled with this book.